These villas offering guests a perfect ‘home’ for family vacation, honeymooners or even business travelers for those who seek a natural Balinese feel, style with privacy and comfort all together. The One Bedroom Pool Villas are measuring 300 to 350 M2, consist of 1 fully air-conditioning Bedroom elegantly designed using mostly natural material like river stones and wooden furniture. The semi open ensuite bathroom featuring a separate shower and an indulgence bath tub. 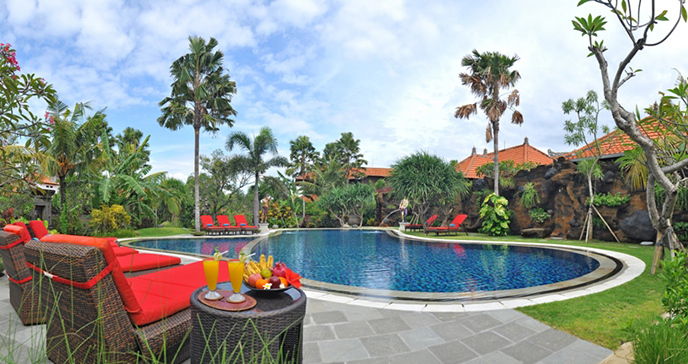 © BALI AROMA EXCLUSIVE VILLAS, Jl.Batu Belig Gg. Pelangi No 8, Seminyak – Bali.